I am not big on having a strict budget each month. Our family doesn’t want to be held back from doing the things we love. Life is too short not to enjoy it. And while enjoying life doesn’t always cost money … a lot of times it does. So instead of sticking to a monthly budget, we try and only buy the things we want to afford. Those things that are worth it like healthy foods, a mortgage, and even a Netflix subscription. However, just because we don’t have a budget doesn’t mean we live above our means. In fact … we always live below our means … no matter what. Ideally, it would be great to live well below our means. But that is where it gets tricky with still wanting to have money available to buy the things we want to afford. Where Did We Spend Our Money in March (2017)? Here is a high level breakdown of where we spent our money in March. We also keep a more detailed breakdown of these categories … but won’t discuss today. It is never really a surprise to see our housing costs at the top of the list. On an average month, we should be paying between 20% and 25% of our spending on housing. This past month, we spent an extra $150 on our annual termite inspection. There is always these little extras that crop up when you own a home. There are several small maintenance projects coming up for us on our home, so we will plan on spending more than just our mortgage in the next few months. This is higher than what we normally would want to spend on transportation. Our cost to fill up gas in our 2 vehicles stays fairly constant at $200 a month. So do both of our car payments, although we have been paying a bit extra ($22) on our first vehicle. We have about 2 years remaining on the loan and are anxious to pay it off. The different in costs this month for transportation (compared to the past) is that we had to pay registration fees for my new car and a tune-up for our family vehicle. That was the case this past month when several of the payments were due at school and for sports team for the kids. As I have mentioned many times, I don’t mind our food costs being high. We are investing heavily in our health and don’t mind spending extra on whole, natural foods. 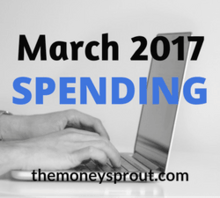 We actually did spend a little less in March on food compared to the previous 2 months. I expect this category to remain the same when it comes to our spending. Not much change in utility costs in March compared to February and January. For the most part … these costs remain static. Our other utilities (water, electricity, gas) tend to balance each other out. For example, our heating bill is very low in the summer but our electric bill is high. In the winter, the opposite is true – high gas bill and usually a low electric bill. This one hurts! We want our savings to be at least 20% of our spending. Actually, we would really love it to be 25% of our spending. When we say “savings”, we are actually meaning investing. We don’t like to let idle money sit around, so invest most of our savings into income producing assets. On the bright side, we did put $5,000 of last years tax refund towards investing in dividend stocks. However, that money is not represented here since it is an anomaly. If we included our $5K tax refund investment … savings would actually be 50% of our spending this past month! I keep saying it every month, but we really need to move our business related expenses out of our personal spending. The only problem … we are not earning any income yet from our business activities. The goods news is that we should be able to reduce these expenses in the future based on a few changes I recently made. This past month we had a couple doctors visits and also started buying some supplements to go along with that healthy food. And while all that is great, we want to do better. Actually a lot better. We want our savings to be at least 20% of our spending. It would be better if it were above 25%. By savings (or investing) at least 25% of our income, we can really begin to accelerate our dividend income stream. And while we are continuing to invest new money into dividend stocks each and every month … we want to do more. Hopefully we can get the ship turned around here in April and beyond. Do you track your monthly spending? How was your March spending?